Thua Thien – Hue (VNA) – The People’s Committee of central Thua Thien – Hue province will distribute 200 billion VND (8.8 million USD) in second advanced compensation to households affected by the Formosa marine environmental incident. Phong Dien district will receive more than 24 billion VND (one million USD), Quang Dien nearly 14 billion VND (616,000 USD), Phu Vang over 68.5 billion VND (over 3 million USD), Phu Loc 73.6 billion VND (3.23 million USD), and Huong Tra town over 19.7 billion VND (866,800 USD). The Committee requested the five localities ensure the progress of the second batch payment of compensation. 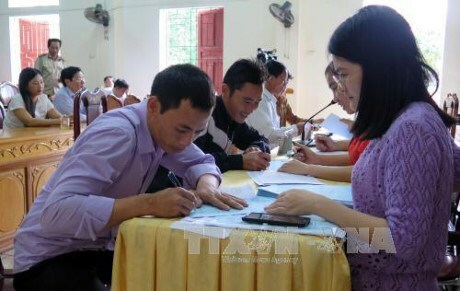 So far, 18,114 out of 19,000 affected households have received compensation worth a total of nearly 322 billion VND (14.17 million USD), accounting for over 80 percent of the total compensation of 400 billion VND (17.6 million USD) in the first phase. Phong Dien district distributed nearly 29 billion VND (1.27 million USD) for 2,046 beneficiaries, Quang Dien district paid over 25 billion VND (1.1 million USD) to 1,329 people, Phu Vang district over 129 billion VND (5.67 million USD) for 6,156 people, and Huong Tra town over 19 billion VND (836,000 USD) for 1,552 people. According to Deputy Director of the provincial Department of Agriculture and Rural Development Nguyen Dinh Duc, most beneficiaries used their first-batch compensation to upgrade or buy fishing tools. In late June 2016, Taiwan-invested Hung Nghiep Formosa Ha Tinh Steel Limited Company admitted responsibility for the environmental incident, which affected the central provinces of Ha Tinh, Quang Binh, Quang Tri and Thua Thien-Hue. It pledged 11.5 trillion VND (500 million USD) in compensation.